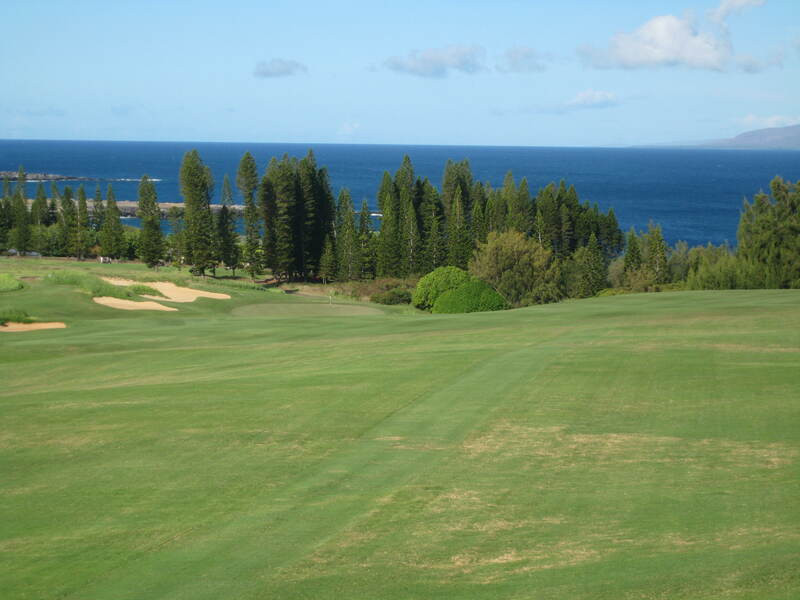 It was very early in their partnership that Bill Coore and Ben Crenshaw took on the task of designing a golf course on the rugged hillside terrain overlooking Kapalua Bay. I am convinced they needed a sherpa guide and a couple of llamas to stake out the tees and greens for their creation. What resulted was something unique, a golf course that yo-yos you up and down some of the steepest terrain you have ever negotiated without carabiners and a climber’s harness. It is a exhilarating anti-gravitational golf experience that calls for creativity and a lot of letting go to be successful. The routing is very creative with holes working straight down and straight up the fall line of the property. The predominant wind direction was taken into account as well and together this makes the printed yardage on each hole almost inconsequential to the length the holes actually play. You can count on a 20 + breeze almost all the time which means links rules prevail, you have to control your trajectory throughout the round and taking the wind into account on your putting is essential. The wild card factor is something I call “ground sheer”, it is the seemingly arbitrary amount of side roll out you get that will take balls to places you could never have anticipated. With this excessive side slip and a cross wind in the same direction and you need to aim into the next time zone just to get the ball into the part of the hole you can play from. The one good thing is they made most of the fairway landing areas like Augusta, there is ample room to maneuver your tee ball to maximize your distance and still stay on the short grass. The bunkering throughout the course is very visually creative and all of them have a tactical purpose. In some cases they are baiting you to try to reach too far but more often it is just a way of forcing you to pick a good line and execute a shot to get there. The greens are very large and often very long, which, with links rules in place, is a positive factor for managing the ball to the flag position on the downwind holes. 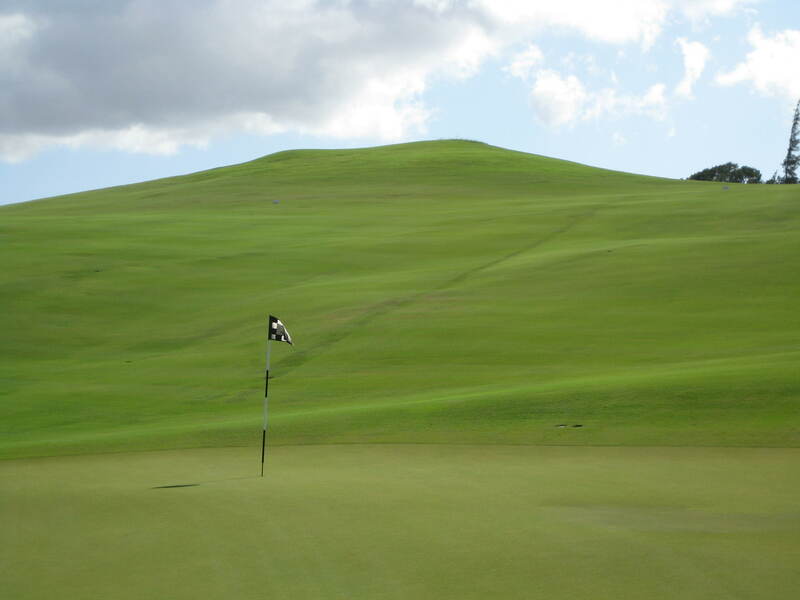 The other architectural factor you have to heed is the segmentation and the prevailing slope of each green. You cannot simply pick a club based on a calculated approach yardage, you have to think of the shape of the shot and how it will respond on the green once it lands. Getting close to the flag is often a diversionary play, hitting it off a side bank to have it end up in the right section of the green. The visuals on this course are in the category of Pebble Beach. Many times it is downright distracting standing on the tee looking at the back drop and then trying to focus on the target at hand. An unbelievable job was done presenting holes that boldly brandish the beauty of this unique piece of property. The versatility of this layout is that some of the most interesting views are back up the hole you just played. Bring a camera, there is a scrapbook of memories to take home with you. The round opens up with a hole that sets the tone for the day, a stunning downhill 440 yard par four. You drive to right center and then the ball just disappears over the hill where you can have as little as 120 into the green. The next three holes work there way back up the hill, yardage is not a factor on any of them, but positioned play is absolutely vital to getting your scorecard off to a good start. 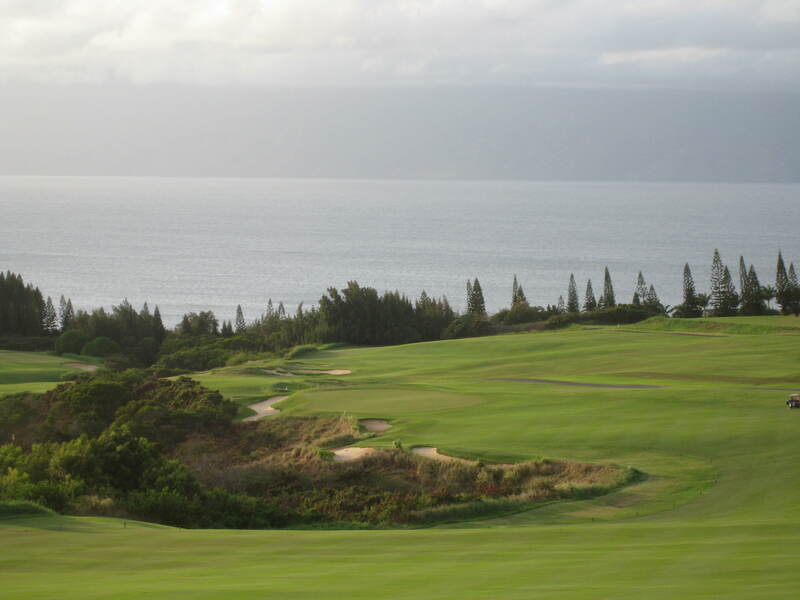 Five is a par five that has all the visual flavor you could ask for in a full round of golf. This is typical of a hole where the look baits you to try things you should not consider, showing restraint is rewarded. When you look at the sixth hole across the environmental divide as you are playing number five you may scratch your head trying to figure out what the hell these guys had going on in their head when they designed the next hole. Standing on the sixth tee of this 380 yard par four the enigma only grows. There is a huge mound containing a huge bunker sitting in the middle of the driving area. As you can see in the picture the back side of this looks like the replica of an Inca holy temple. What you cannot see is that a bold driving line between the bunker and the right abyss will feed the ball into the power slot and take the ball to foot of grandmother’s house. When you end up pulling your tee ball left of the bunker because of your subconscious defensive nature you will have to use two clubs less and the ground sheer of the back side of Machu Picchu to feed down to the green. This is where creativity and trust will serve you well. Your scorecard on the front will be saved or doomed by how you negotiate the next three holes. Seven is a 465 yard par four playing straight down the fall line. Picking a good line on both shots and letting gravity do it’s thing will be rewarded. Eight is a no nonsense dartboard par three across the vegetation wilderness. The exposure of the ball flight to the wind makes finding this green a real chore. Nine is almost unplayable by mere mortals, you have to hit three high quality shots into a strong headwind to an uphill target. The green complex is so difficult that even good shots can be repelled so be prepared to turn the other cheek and accept your fate on this hole. The weakest aspect to the course is the first five holes on the back side. All five are short and extremely technical holes with maximum ground sheer and probably the most exposed wind conditions of the day. The big hitters will be very uncomfortable in this section of the course muttering under their breath phrases like “unfair” and “are you kidding me”. I share their concern because the concentration of holes like this in a run seems to derail the “cut it loose” feeling from the opening nine. The finish is outstanding, a series of fun holes the thoughts of which you will carry with you well past the end of the day. You cannot help but notice the guard rails that occupy the right side of the driving area on fifteen-this is a strong statement to the ground sheer right on this hole. The visual of the green complex while as stand over your second shot is very disarming. Playing the next two very demanding shots and giving yourself a birdie chance is quite gratifying. Sixteen is just another one unlike anything you have played already today. You have a decision to make as to which side of the split fairway you want to play from-that decision will change the approach shot considerably. If you have watched the annual PGA Tournament of Champions played here each January you are familiar with these two finishing holes as the most severe downhill holes they play all year. The first of the two falls below your feet like bungee cord jump waiting to happen. Elevating the ball down the center the ball will disappear from sight and just keep rolling until it reaches the bottom of the hill about 300 yards away. The second is a real beauty across the trouble to a green clinging precariously to the hill above you. Managing the roll out of this shot is trick-the contour of this green will be kind to the right shape and trajectory of approach. This final hole so often determines the winner of the PGA event each year-the pros can make anything from 3 to 7 and you will be amazed you have the same proposition facing you. You aim your drive at the clubhouse right of the fairway and, to your amazement, when the free fall of your ball and the ensuing roll out is done you are pinned to the left edge of the fairway almost at the bottom of the hill. The downhill second shot is within reach of the putting surface but you must aim well right of the green and let gravity do it’s thing again. If you are not on, the ensuing pitch is like trying to stop your ball on the hood of a Mini Cooper, it will take full creativity and use of the ground to pull this off. The coolest part is that if you play this hole well you did it in front of everyone lunching in the clubhouse grill overlooking the entire hole. You can just feel the appreciative applause. These last two holes are an adrenaline rush like you have never experienced before on a golf course. 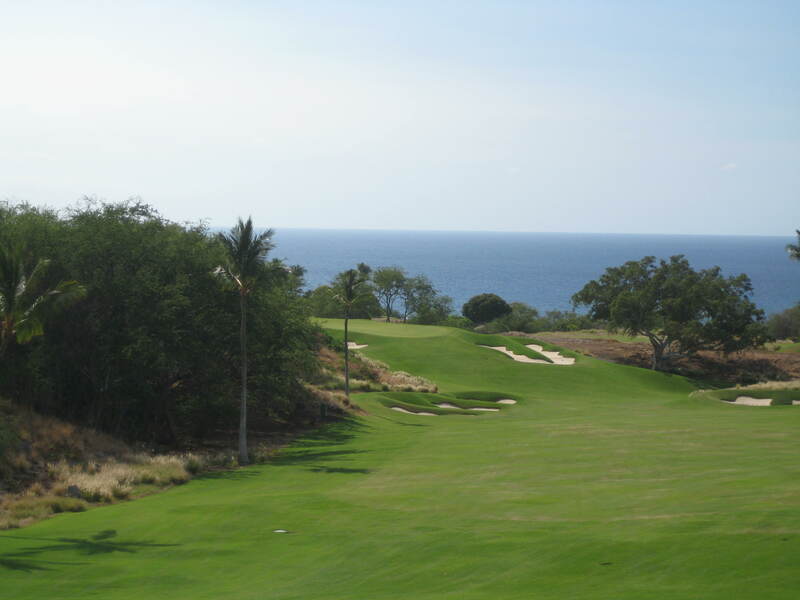 Robert Trent Jones was “the man” among golf course architects in the 1960’s when he was asked by his wealthy friend Laurance Rockelfeller to design a course to compliment a $15 million dollar remote destination resort being contemplated for the arid west coast of the Big Island. Trent was confronted with a challenging piece of hilly, lava entombed real estate next to a large piece of paradise. It took all his creative skills and engineering prowess but he did a marvelous job orchestrating the ground into a stage for an unforgettable golf experience. Much like his creations from this same period at Spyglass Hill or The Golden Horseshoe, he found a way to use the tumultuous terrain to his advantage to provide startling vistas and tactical golf challenges. Robert Trent Sr. was one of the patriarchs of the heroic school of design so this one is not for the feint of heart. It was updated by his son Rees in 2008, who is another one who does not cut any slack for the meek, so if anything the resulting course became harder. His son’s renovation work looks to have touched every corner of the property. The main improvement was the move to the latest version of Tiff Bermuda grass throughout which makes it more durable and environmentally friendly to maintain. They say the irrigation systems and the drainage were improved to solve long standing issues. What you see are typical Trent Jones greens-sprawling and segmented to make them tactically relevant-that roll a top speeds because of the new grass. The bunkering has Rees’s fingerprints all over it-plentiful, artistic, always front of mind. His presentation of these green complexes will take your breath away and often leave you scratching your head walking to the next tee. The bermuda grass presents a particular challenge when pitching and chipping around these greens. Steep swings get caught in this sticky grass which takes the high lob shot out of your repertoire for the day. What you see is a place with a real 60’s retro feel about it-the architecture of the buildings and the residences throughout the property are that low square “I Spy” California look. They have recently redone the golf shop and Number 3 restaurant to bring them up to the quality of the rest of the facility. The only disappointment is the practice area which remains in dire need of upgrade, expansion, and softer golf balls. 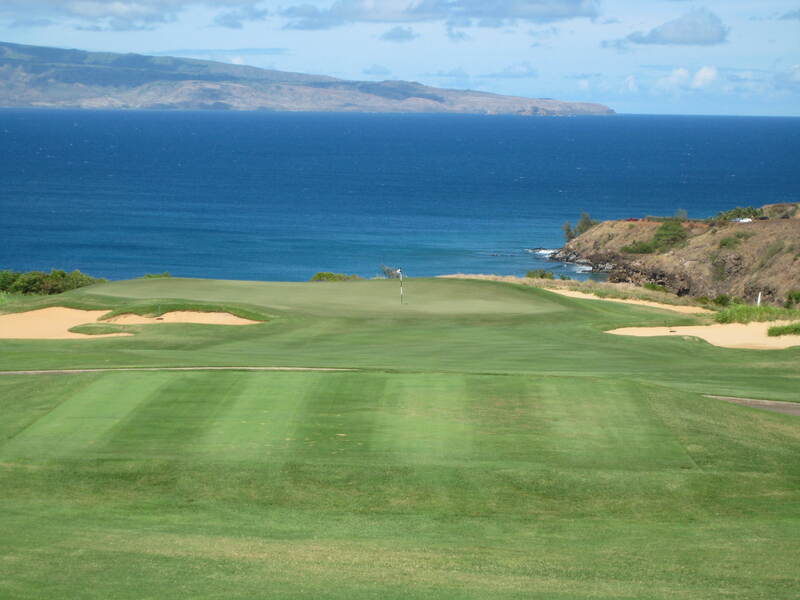 They could also do a much better job in relating to you the green topography and pin positions of the day, especially since both should figure into your playing strategy on every hole. 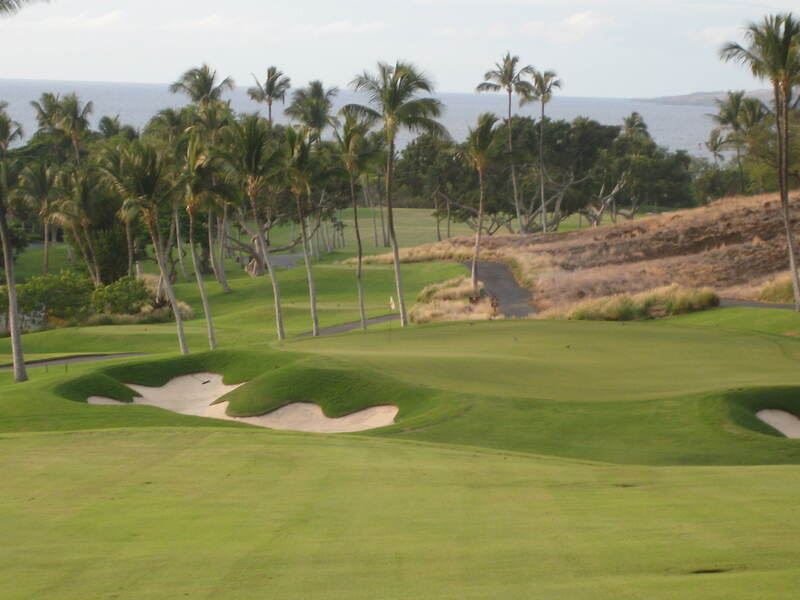 Robert Trent’s challenge at Mauna Kea was two-fold, he had to make arid land seeming inhospitable to grass growth suitable for golf and reign in the rugged topography to route holes that were challenging, playable, and would showcase the dramatic vistas of the Hawaii’s Kohala Coast. 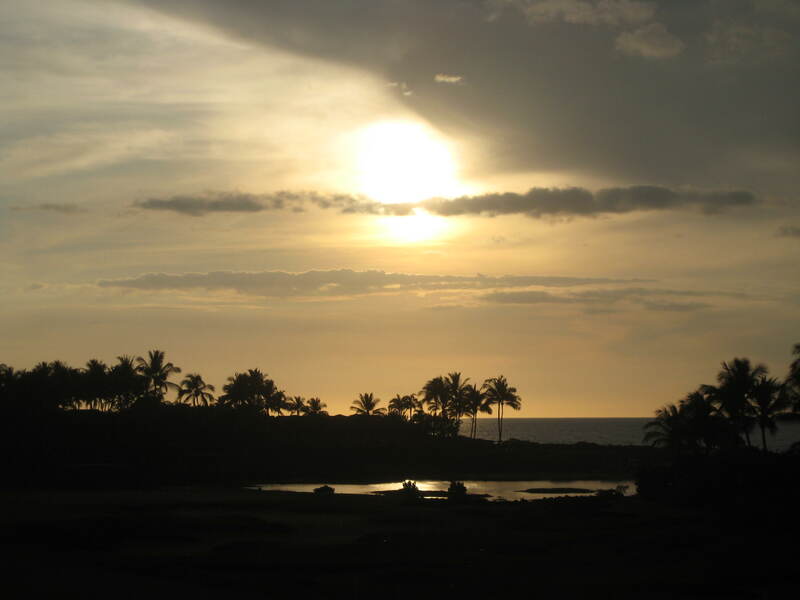 Lava fields dominate the coastal areas on this side of the Big Island creating a rocky wasteland over the 230 acres intended for the site of the golf course. This side of the island gets very little rainfall so finding the water to support any vegetation would be a challenge as well. Trent realized that there were two kinds of lava present-brown lava that can be crushed to a powder mass and blue rock lava that is virtually impossible to break up. Managing a metamorphosis of this ground to make it suitable for golf seemed like an insurmountable challenge. Never one to back down from a challenge Trent and his experienced engineering crew developed their own engineering techniques and processes that enabled the use of the crushed lava as a soil base on which he added a mix of lime and crushed coral dredged from the nearby bay to grow a hybrid brand of Bermuda grass with great success. The water he needed was provided by drilling a couple of wells almost 400-feet deep coupled with the first fully automatic underground golf course irrigation system of their own creation. The result was astonishing, green grass flourished in what had appeared to be an arid desert. The blue lava was either blasted, buried, or left alone as an accent to the developing holes. The cost of all this was over $2 million dollars, equivalent of close to $15 million in today’s currency, an unheard of expenditure for building a golf course in those days. But Rockefeller had the deep pockets and the desire to have a special centerpiece to his high end resort. 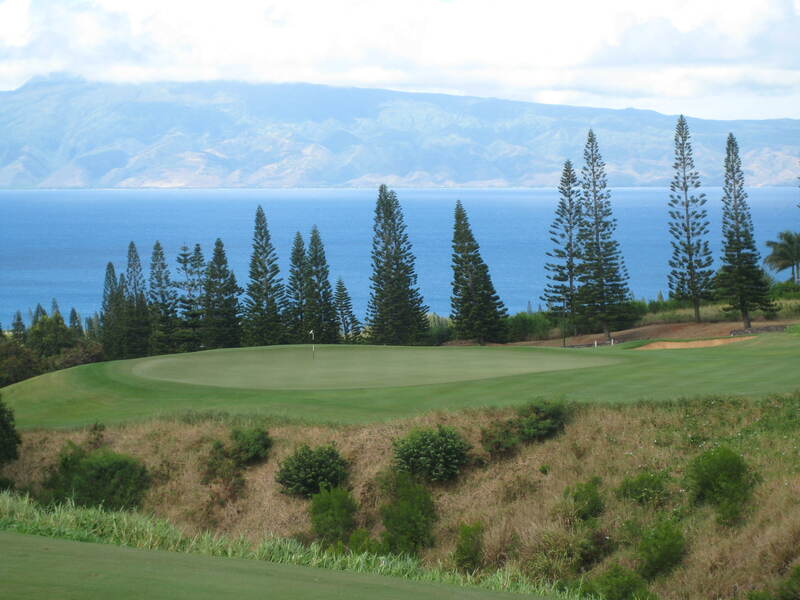 Robert Trent’s challenge was to reign in the rugged topography and route holes that were challenging, playable, and would showcase the dramatic vistas of the Hawaii’s Kohala Coast. Routing the holes straight up and down the slopes he gives you some very severe elevation changes that will increment club selection but very few holes with side ways roll offs. This makes picking and maintaining shot lines much more manageable. As is often the case with this type of terrain, there is rarely a long run for a straight fairway so most of the holes bend dramatically or are folded to fit the available shape of the land. 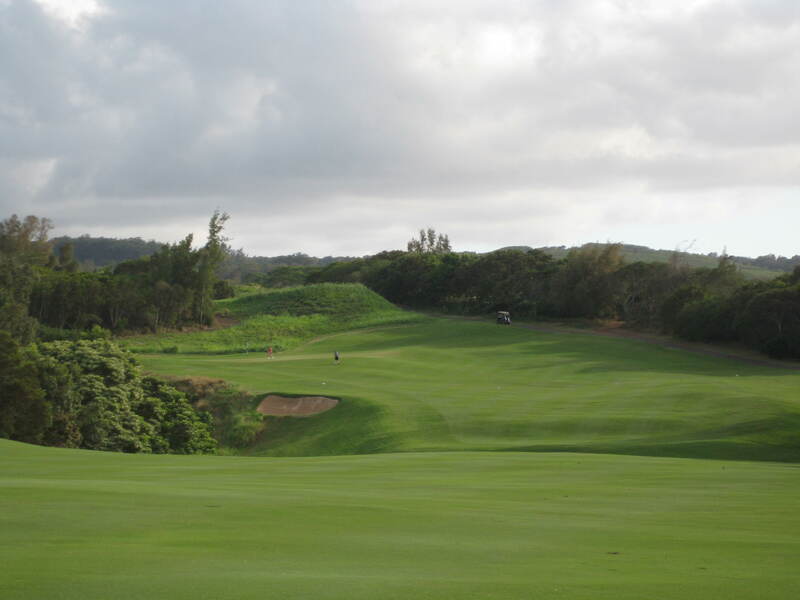 The result is that there are many short par fours that play from a high tee to a landing area below and then turn dramatically to a four-story green complex on top of the next hill. This template will wear on you, especially if hitting high elevation, full carry approach shots is not in your wheelhouse. For me the par threes are the centerpiece of this course. Number 3 is the signature hole with the Cypress Point look and not as much ocean to carry. This is a photo opp for sure so you can expect a backup due to clicking digital cameras. Number 11 is another absolute beauty-a medium length par three. It is a downhill look at an evasive green nestled against the ocean-it brings to mind the 7th at Pebble with a much longer club in your hand. The par fives are some of the most imaginative you will play anywhere. Here Trent uses the incline, some carefully placed fairway bunkers, and dramatic green arrangements to give you chances for success or disaster on every one of them. Eight and seventeen are tumbling dice affairs where you cannot believe how far your ball has traveled and are tempted to do things you probably should not consider. Of the par fours I like nine and eighteen in particular because both give you the distracting dramatic look of the coast line below but demand you control the line and carry of your shots to have a scoring chance at the end of each side. Sequencing of the holes is what creates a tactical momentum for any course. He did a marvelous job in this regard starting you out with relatively easy holes each nine and then quickly picking up the challenge in the next few holes. Once you reach that level the challenges come in a variety of forms in rapid succession, you barely get over the rush from the last whole when the wow factor of the next tee hits you. This is a course where you will have a bad hole but there are plenty of chances to redeem yourself with smart decision making and timely shot execution. As I said earlier, this is not a course for those who are not up for a stiff challenge. If you cannot hit the high carry shot or big bad bunkering intimidates the hell out of you then take the day off and go to the beach instead. But if you are up for it this is Robert Trent Jones at his macho best. Play well here and you will have some serious big fish stories to lay on your friends. 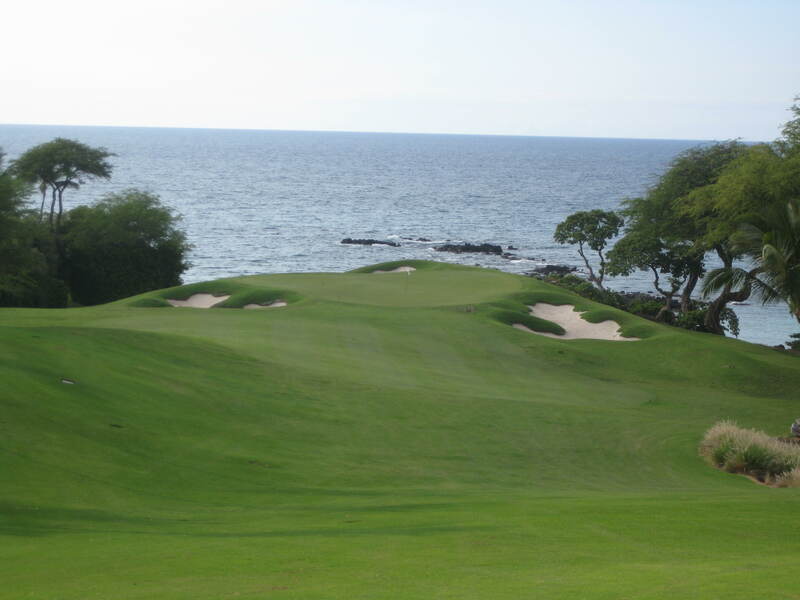 The Four Seasons needed to create a name brand golf course as the centerpiece for their residential resort community on the big island in Hawaii. 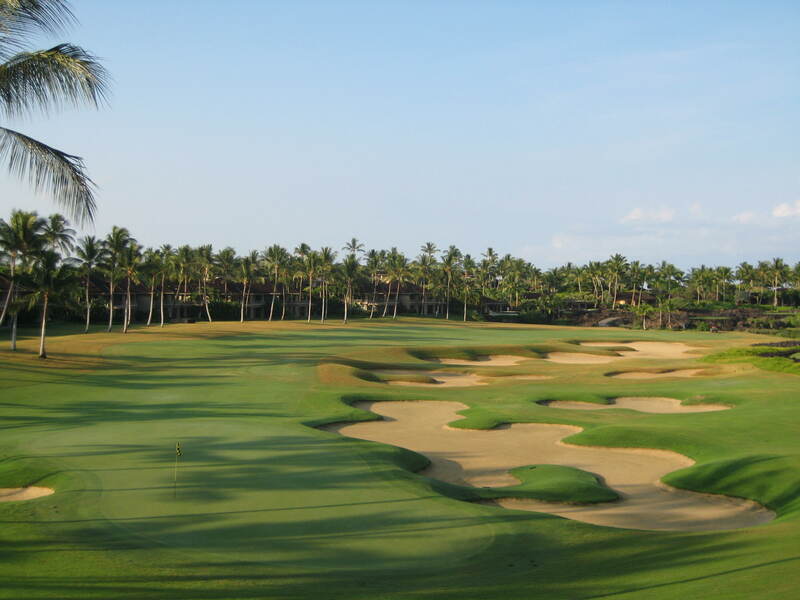 Jack Nicklaus was retained and did a first class job delivering them a visual and memorable resort course for their guests and home owners to enjoy. This is a user friendly track with wide driving areas, accessible greens, and not a whole lot of deception. They host the opening event on the Apostle Tour each year, so you are likely to remember seeing old guys in January begging against the wind on the last two holes. 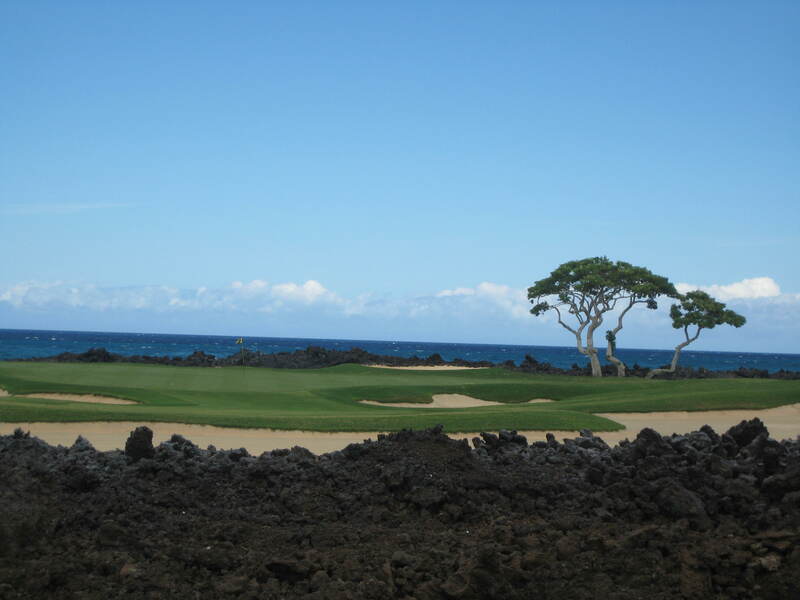 The signature feature of this course is that it was built on the black lava fields of the eastern Kohala Coast and Jack’s goal was to meld the holes into the up and down flow of the lava fields. 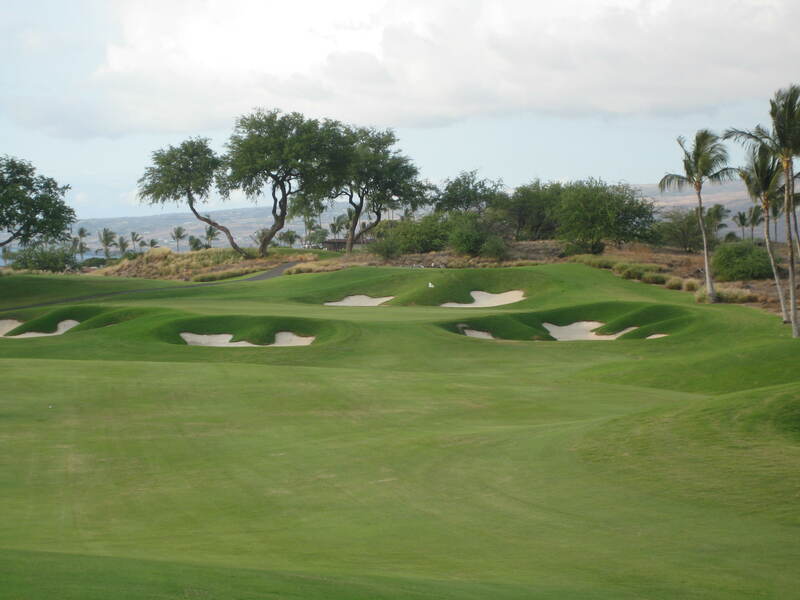 The lava creates a harsher version of the gorse or the heather on the Scottish courses setting a stark visual outline on every hole for the lush green of the Tiff Bermuda fairways and greens. If you look up the eastern horizon to the mountains from which this came, you do get a real sense of the topographical flow of the element and how it defines the character of this course. 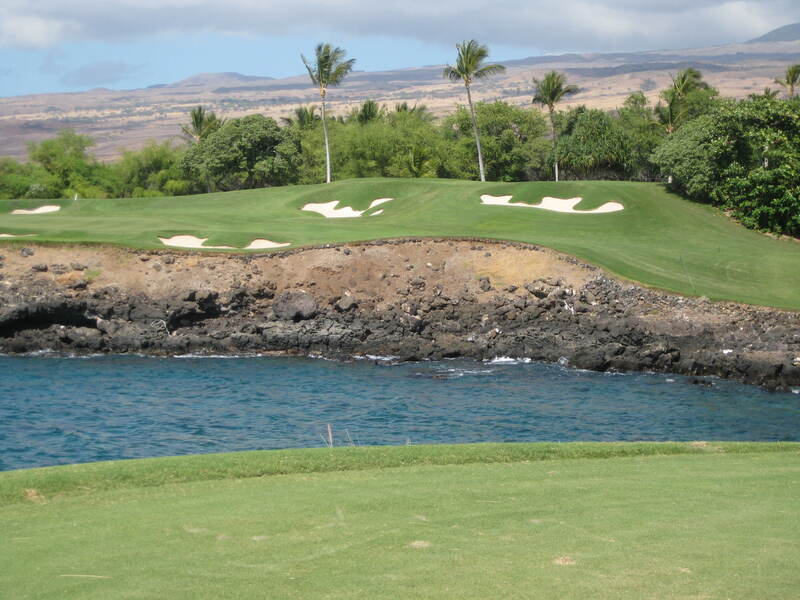 For the most part, the lava is set off the immediate playing areas and there are only a select number of times where it becomes an integral part of the golfing challenge. The more significant tactical challenge is Jack’s generous use of fields of fairway bunkering. From the first hole to the last you will see repeated occasions where an entire side of the hole is bunkered, creating a dogleg effect on it’s own. Missing into the sand on that side of a hole can be a scoring disaster. The course begins with a typical low impact Florida style par 4-wide fairway-open access to a big green-no lava. But you cross the road and enter a lava quarry which prepares you for the full lava look. 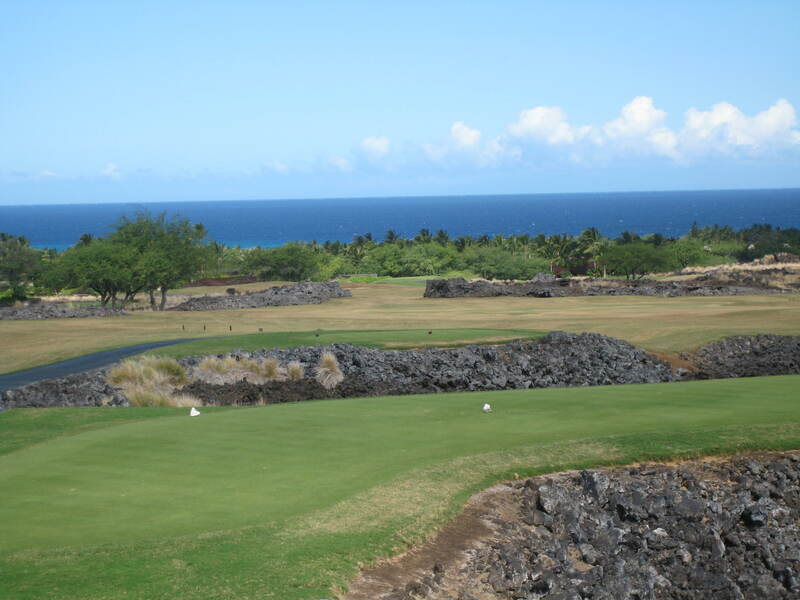 Number two is a visual bait and switch landing area and then a large lava dune on the right obscures access to a very tight green. The rest of the way is pure lava eye candy. The short par four sixth is a great example of lava outline that can appear intimidating with a green complex set in a lava canyon but there is a collar bunker off the back of the green that keeps balls from getting lava burn. Seven is a unique par five where after you drive to a wide open landing area and play your second down a lava hallway that chokes the fairway framing the required lay up shot. There is an over-hyped cookie jar with some oatmeal raisin and chocolate chips at the turn but the fresh fruit in the cooler is a refreshing touch before you begin the inward half. The five pars on the back are the most interesting holes of the day. 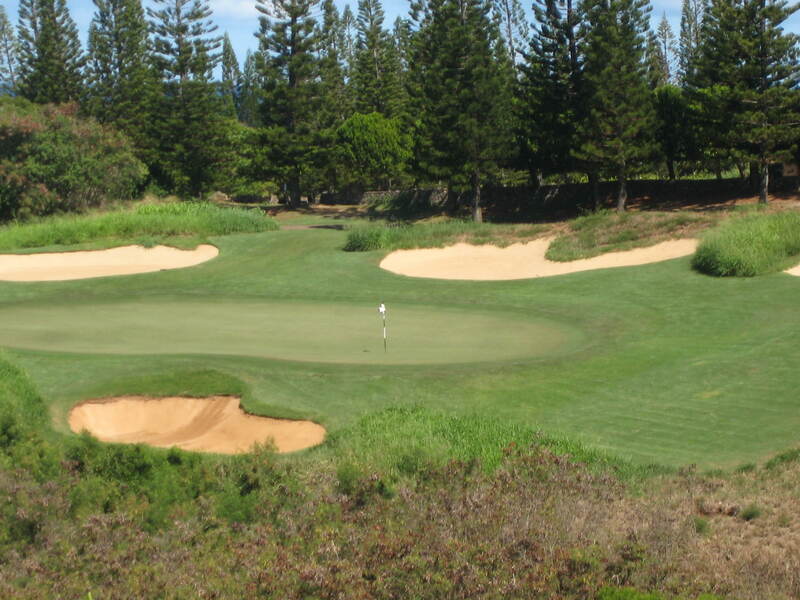 Ten is a serpentine par five that requires full focus on your lay up shot to have a look at a green hidden behind an acre of sand, trees, and lava. From twelve to fourteen you are as close to the ocean as you are going to get so the wind becomes a major factor in all club selection. Fourteen is another very imaginative par five with a hide and seek green complex that is difficult to negotiate with a wedge in your hand. The finish is all finesse as you head back toward the clubhouse. A couple of technical par fours before you reach the signature seventeenth, the only hole that is truly exposed to the Pacific. Here you have to parasail one through the sea breeze onto a well protected green-anything left hits lava and heads toward Japan. 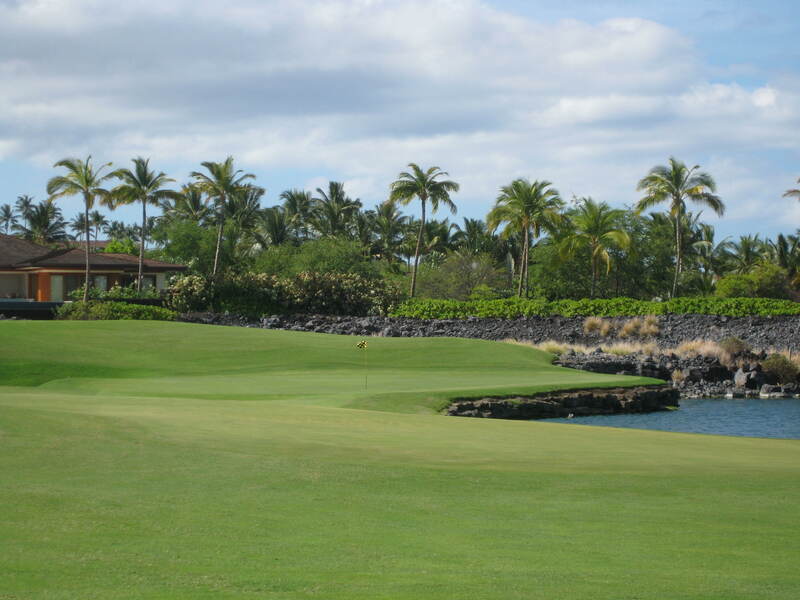 The finish is a beautiful short par four over ancient Hawaiian fish ponds and a Nicklausian sea of sand into a demanding tight green set. This is a Four Seasons so all the amenities are first class. A sprawling practice facility is at your disposal with a couple of acres of grass teeing area, pitching green, and a large ambling putting green. Perfect recluse for a five o’clock practice session to sort out the demons you encountered today. There is nothing like the tranquility of downhill ten footers dropping into the cup as the sun dips back into the Pacific Ocean.